PULLMAN, Wash. – In the mid-to-late 1200s, some 30,000 ancestral pueblo farmers left their homes in southwestern Colorado’s Mesa Verde region and never returned. Where these people went and why they left are two of American archeology’s longest-standing mysteries. A new study co-led by archaeologists Tim Kohler, of Washington State University, and Brian Kemp, formerly at WSU, now at the University of Oklahoma, provides the first genetic evidence suggesting that many of Mesa Verde’s ancient farmers moved to the northern Rio Grande area in New Mexico, a region currently inhabited by the Tewa people. The study, published in the scientific journal PLoS ONE, also included authors from the University of California, Davis, and the University of Colorado. It strongly suggests the ancestors of the Tewa-speaking Pueblos lived in the Mesa Verde region and migrated to the Northern Rio Grande during the late-thirteenth century. Complying with federal laws regarding the handling of human remains, the researchers took an unusual approach to chart the ancient Pueblo people’s migration out of Mesa Verde. They examined DNA extracted from the bones of prehistoric turkeys that the people domesticated. Ancestral Pueblo inhabitants raised turkeys as a vital source of food protein and used the birds’ feathers to make blankets, Kohler explained. For the study, he and his colleagues worked with museums and other archeological repositories across the Southwest to gather pre-1280 Mesa Verde turkey remains, as well as turkey remains excavated in the Northern Rio Grande from before and after the Mesa Verde exodus. A small cliff dwelling in Mesa Verde National Park dating back to the thirteenth century. Mitochondrial DNA extracted from the pre-1280 Mesa Verde turkey bones matched the DNA of Rio Grande turkey bones from after the collapse of the Mesa Verde society but not before it. While the research team also looked at mitochondrial DNA from what were thought to be domestic dogs buried at Mesa Verde and in the Northern Rio Grande area, they were not able to find a conclusive genetic connection between the two populations. The Mesa Verde region was one of North America’s largest population centers in the mid-thirteenth century. 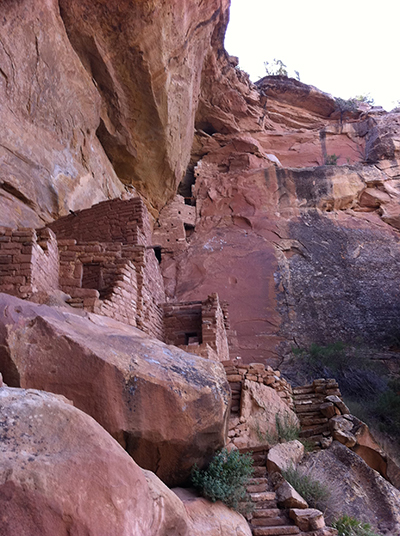 The ancestral Pueblo people left behind nearly 5,000 known archeological sites, including 600 cliff dwellings. For the last 20 years, Kohler has used sophisticated computer simulations, called agent-based models, to investigate what could have caused the Puebloan people to leave. He and colleagues in the WSU Department of Anthropology helped launched the Village Ecodynamics Project in 2001 to simulate how virtual Pueblo families, living on computer-generated and geographically accurate landscapes, likely would have responded to changes in specific variables like precipitation, population size and conflict over a limited food supply. Their work revealed that severe drought, resource depletion and social upheaval likely triggered the massive migration south to New Mexico and Arizona.